Let me say at the outset that my opinion of the recently concluded PulpFest might be colored by the fact that I was a committee member and therefore saw the convention through different eyes. Having said that, I think the event was quite successful. The last time I checked — early Sunday morning — paid attendance stood at 374, down from last year by almost exactly 10 percent. However, I nonetheless consider this a triumph for several reasons. First, the economy stinks and many people have been forced to cut back on discretionary spending. Second, the price of gas has spiked in the last few weeks, hurting people making long vacation drives. Third, the high cost of downtown parking likely accounted for the decline in curiosity seekers who typically visit us for a day as a result of the local publicity we generate. And fourth, in moving from the Ramada Plaza to the Hyatt Regency we increased the per-night price of a sleeping room by $30. That alone might have been a deal-breaker for some people; at the very least, a three-night stay meant something less than a hundred dollars of disposable income for each person — money that could have gone toward dealer-room purchases. Frankly, under these circumstances I was delighted to see us attract as many folks as we did. The Hyatt Regency and its adjoining convention facilities were more than adequate for our needs, and even with the increased costs it proved a much better venue than the increasingly lackluster Ramada Plaza. The number and proximity of eateries was a definite plus, with sandwich places in the downstairs Food Court sufficing for quick lunches and numerous restaurants within walking distance providing a plethora of acceptable options for more leisurely dining in the evening hours. Among the (very) few complaints I heard was that the massive ballroom we selected for our dealers lacked bright lighting, and I have to agree. When you’re inspecting old books and magazines priced at hundreds of dollars, you want all the light you can get. Our programming room, which housed the auction, presentations, panel discussions, and film screenings, was extremely spacious and could have handled a hundred or more people than we had. It’s nice to know that our new digs will allow us room for growth when (or if) the economy improves. As usual, our programming was quite well received. While we were scheduling the various events, I somehow managed to overlook the fact that I would probably be exhausted when I arrived at the hotel on Thursday after ten hours of driving. So it might not have been a great idea to volunteer for not one but two Thursday-evening presentations, the second closing out the night’s activities. Early on Garyn Roberts and I discussed the “Golden Age” of John W. Campbell’s Astounding Science Fiction, the leading SF pulp. Then, following two more events, I came back to deliver a paper on the making of New Adventures of Tarzan, the 1935 serial produced by Edgar Rice Burroughs himself. This was followed by a screening of the extra-long first chapter, and by the time it finished unspooling I was looking for toothpicks to prop my eyelids open. L to R: Henry Franke, Garyn Roberts, Ed Hulse, Will Murray, Steve Haffner. The next night we had several excellent presentations. In keeping with our theme — a 100th-birthday tribute to ERB and his best-known creations, Tarzan and John Carter — Guest of Honor Mike Resnick described his early fascination with Burroughs and his determination to write novels in the ERB vein. Although I missed his talk, I’m told it went over very well. Later in the evening I moderated a panel on the competing visions of Mars offered by popular pulp writers. Burroughs Bibliophile treasurer Henry Franke weighed in on ERB, novelist and historian Will Murray covered Burroughs imitator Otis Adelbert Kline, Stephen Haffner talked about Planet Stories favorite Leigh Brackett, and Garyn Roberts shared his views on Ray Bradbury and the Martian Chronicles stories. The Munsey Award is given annually to someone who has significantly increased awareness and preservation of pulp fiction. This year’s deserving recipient was Matt Moring, whose Altus Press has published dozens of high-quality pulp reprint volumes in a few short years. 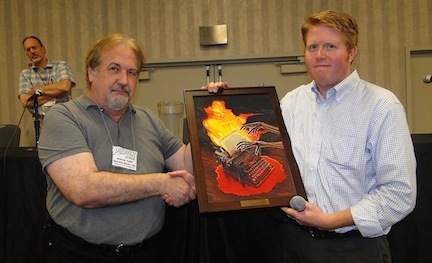 The first Rusty Hevelin Service Award (named after the long-time steward of Pulpcon, the original gathering of pulp collectors) was presented to PulpFest chairman Jack Cullers, whose tireless efforts on behalf of our little community should have been recognized long ago. Both winners are eminently worthy and deserve thanks as well as congratulations. 2011 winner Anthony Tollin (L) presents 2012 award to Matt Moring. The Saturday-night auction was dominated by items from the collection of Al Tonik, one of the most enthusiastic pulp fans the hobby has ever known. Although Al sold most of his pulp magazines years ago, he kept hundreds of reference books and reprint volumes, some of which are now quite rare and collectable. Among the goodies fetching nose-bleed prices was his set of PEAPS mailings. For those of you who don’t know, PEAPS stands for The Pulp Era Amateur Press Society, and its quarterly mailings — sometimes running to several hundred pages — are comprised of often lengthy contributions by members. PEAPSters tend to be research-minded folks happy to share their discoveries with fellow members, and many a Blood ‘n’ Thunder article has been inspired by or reprinted from those thick, info-packed mailings. Al’s complete set, which filled many bulging boxes, sold for an astonishing $1450. Well over 300 lots were disposed of, making this year’s auction a real endurance contest. I gave up shortly before 1 a.m. with about 50 lots to go. In a major blow to Murania Press, my printer failed to make timely delivery of the anticipated copies of Blood ‘n’ Thunder’s Tenth Anniversary Issue, which I had promised to debut at the show. A snafu at the plant caused the shipment to go out one day late, and without the critical “For Saturday Delivery” instructions for UPS. Therefore, the shipment arrived on Monday — too late to do me any good. However, I’ve now got those copies in hand and have just started shipping them to subscribers. I did, however, receive the promised copies of Pirates of the Pines, Volume Three in Murania’s Classic Pulp Reprints series, and I sold every single one of them. In fact, I wish now I’d ordered a dozen more for the show; probably could have sold most of those too. Overall I thought this year’s PulpFest was a great show. There’s always apprehension when a convention committee moves to a new venue; dealing with each hotel presents its own challenges and you feel as though you’re reinventing the wheel. But as near as I can tell, our move to the Hyatt Regency went about as smoothly as we could have hoped for. 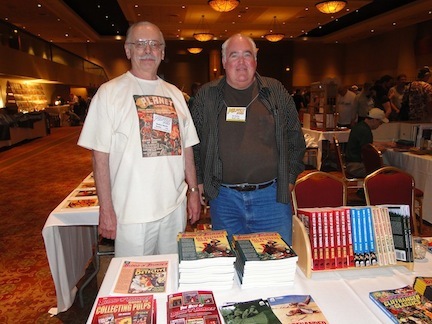 Veteran pulp collector Walker Martin (L) with Murania's Ed Hulse. Believe it or not, the PulpFest committee is already kicking around themes for next year’s confab, and before much longer you can expect to see a big announcement both here and on the PulpFest site. Good report Ed. Hopefully by next year something can be done about the lighting. A great show by any measure. I am confident that many worked very hard behind the scenes to prepare the panels, the presentations, the auction. The highlight for me, as it always is, is to meet and talk with others, and to network. Breakfasts and dinners are always interesting, and good food is a always a bonus. George, I’m glad you made it back to the wilds of Canada. I was worried that they might have arrested you at the border as a suspicious alien. Great report. I hope to be there next time. Thanks for all the work you and the rest of the committee put into running this show. As always, I had an excellent time and in already looking forward to next year’s show. Great show, nice new venue. You organizin’ and committeein’ guys and families (the extended committee, I call ’em) did a great, great job, Ed. Thanks so much to all of you. Ed, thanks for the report and the pix. I think Laurie is going to do a report once she gets the photos to use. It is nice to see the show has re-invented itself, came back stronger with purpose. You guys are doing a fantastic job. Hope to be there next year. I have been reading the various con reports, with many citing the low lighting problem and some hoping it will be better next year. Did anybody complain to the hotel during the con, and if so, why wasn’t the problem corrected? Jack Cullers brought up the low lighting problem with the hotel and they said nothing could be done. Ed, nice report! I felt the con committee did a wonderful job. The new venue is ideal and in an ideal neighborhood. I enjoyed this PulpFest as much or more than any of the previous three. I think attendance was especially encouraging, considering the direct confict with two other major nostalgia type shows. I can’t complain about the price of parking; it cost me only $8 for all of Friday and Saturday at the Drury lot, between the Hyatt and the Drury. The lot had covered access to the Hyatt; it was one of the best parking situations I’ve ever encountered in a downtown area, and that includes San Diego, Seattle, San Francisco, Oakland, Chicago, Dallas and many other sites I have visited. Oh, don’t forget how Sally Cullers shared in the Rusty recognition with Jack. Jack’s great, but Sally goes above and beyond every year! Thanks again to all of you for doing a wonderful job! Ed, a great convention.I enjoyed myself and so did everyone else I talked to.The only thing wrong with your report was the photograph of the thuggish looking person standing beside you in the photo.We really have to have someone at the door to keep the riff-raff out.